I have long valued organization in my life—whether of my time or of my space. I feel better when structure is present in my calendar and in my environment. One of the practices I use to stay organized in my personal life is a running to-do list, which I call my Weekly General Task Plan. I keep this in an Excel spreadsheet on my personal laptop and like this format because it is easily modifiable and allows for columns. My list contains four columns: Task, Date, Priority and Notes. I’m sure there are more sophisticated strategies out there, but this is simple, and it works for me. I keep a list of tasks. Some items on the list may only appear once. For example, a list last weekend included assembling my new 6-cube organizer. This is likely to be the only time this particular task will appear on my list. Other items are perpetually on the list because they are done regularly or periodically, and I simply update the date column to reflect the next time I will work on those tasks. Tasks in this category include organizing the weekly calendar and sending it to my family or managing my finances each payday. I like having this list because there are things that I want and/or need to do, but I may not be ready or able to do them right away. By capturing them on my list, I don’t have to spend mental energy trying not to forget. I know they are on the list, and I have assigned a date for tackling each project. Once it is on my list, I can let it go until the assigned date. This basic system has worked well for me for years. In the past, my list has looked somewhat different. For several years, I kept it on paper and just transcribed it to a new sheet in the notebook each week. This worked okay, but it was more cumbersome and less efficient for capturing future projects. I have used the spreadsheet method for a couple years now. Late last year, I started to notice that I felt a sense of fatigue each time I looked at my list, like a heavy, hopeless weight was dragging me down. I felt more anxious and less productive because of it. I decided to make a simple change that has made a surprising difference for me. I decided to limit the number of tasks that I assigned to and prioritized on a given day. As a general rule, I will assign no more than three tasks to a work day with no evening activities, one task to a work day with an evening activity and five tasks to a weekend. This is not a foolproof strategy, nor is it an exact science, for several reasons. First, not all tasks are equal. For instance, updating my website takes considerably longer than planning the calendar for the week. Not all days are equal either. A night with a haircut leaves more time than a night with a Scholars Bowl meet. However, this small adjustment in my strategy has been tremendously helpful. Immediately upon implementing this new approach, I felt a lightness come over me. Before paying attention to how many tasks were on a given day (A weekend day might have a list of 13 items! ), although I had no real expectation that they would all get done, they all felt like obligations hanging over me. Not completing them all felt like some level of failure. Now, not only did I have the possibility of the success of completing all my tasks in a given day, but I also had the possibility of something amazing—free time! It had been a very long time since I really allowed myself free time. Since my daily lists seemed endless, I felt like I always had to be working on the items on the list. Taking time away from them, except for exercise and family obligations, felt like slacking off. Suddenly, although the total number of items on the list may be similar to what it was previously, they are spaced out more realistically, and each day appears much more manageable. And, once I complete the tasks on my daily list, rather than start on tomorrow’s list, I give myself permission to read, watch a movie with my husband and son or do something else for enjoyment. This may not seem like an earth-shaking idea—putting a realistic number of tasks on the day’s to-to list—but it has been transformative for me. It has led me to consider the importance of time and space and of creating space in time in our lives. Being organized and getting things done does not require being busy every moment of every day. And, putting an achievable number of projects on the list for the day does not mean that I am lazy. It means that I value my time, and I value the items on my list enough to work on them in a span of time that allows the reasonable possibility of accomplishing them. Sometimes, items still get pushed to the next day or to the next week, depending on their urgency, but I work on them in order of priority, so this is not usually a big deal. They are still on my list, and they will still get done. I am respecting the fullness of my life, while still moving forward with activities and projects that are meaningful to me. It has been surprising that something so simple has made such a big difference, but I am getting more done, and I feel less stressed and weighed down by the things that need to be completed. It is easy to implement a system like this for yourself. Use your favorite method to create your list. The modifiability of an electronic system appeals to me, but you might like something else. Make a list of all the recurring, short-term, and long-term tasks that are on your mind or on other lists. For me, the order doesn’t matter because I prioritize them in another column. Assign a date that you will work on each task. Each evening, prior to going to bed, assign a priority ranking for the next day’s projects, from one to five on weekends, one to three on work days without additional activities and just one for workdays with other activities happening. If you find that a day has more than the appropriate number of items–five, three or one—depending on the type of day, choose other days for the lowest-priority tasks. Work on your projects each day, but have a cutoff for bedtime because sleep and self-care are important, too. Whatever is not done at that time gets moved to the next, or another, day. Check-in nightly to prepare for the next day. I think you will be surprised—both at how liberating it is to limit the number of to-do items each day and at how your productivity increases. Certain projects may be more involved and require multiple steps. The steps can represent items on your list. If it is really important or a very big project—for instance, a course proposal that I recently put together—I break the project into steps and then block out a certain amount of time each week to work on it. On the given day, the project functions as one of my task items, possibly the only one if it is a work day evening. While I may tweak my system over time, I am happy with the changes I have made and have seen a noticeable improvement in both productivity and quality of life. It is incredible what creating a little space in my schedule can do. What does it mean to live with no regrets? How would committing to doing so change my decisions daily and over the long term? I will turn 50 in June 2019. That number seems both impossible and momentous. It feels like it is time to get serious about the things that truly matter to me—to be clear on what those are and to take concrete steps toward achieving them, with tangible results. So, I will start 2019 thinking about where I want to be when I turn 50 and then use that base as a springboard to keep moving in the direction of no regrets. My recent review of 2018 revealed too many disappointments—mostly in myself over decisions I have made, inaction, stalled progress or indecision. I want to reach the end of 2019 and look back with satisfaction and a sense of accomplishment and hope for the future. Toward this end, I have written a “No Regrets Manifesto,” detailing the actions I will take to make 2019 a year of no regrets and one that propels me forward in a life of no regrets. Do I have any regrets about my choices today? How will I live with no regrets tomorrow? I will also review my manifesto at least monthly to make sure I am on still on the right track, and I will be willing to adjust if I am not. Truly committing to living with no regrets is scary, as important pledges probably should be. For me, it means little room for error. Others may be more forgiving in a plan to live with no regrets (and it might be healthier to be), but I know myself, and I have low tolerance for my own missteps. Of course, that can be counterproductive because it may also cause me to avoid risks that could help me live with no regrets, so it will be a constant effort to make sure I am really choosing the best path. Truly committing to no regrets also means committing to live boldly. It is a fine line between living boldly and minimizing error. I think my biggest errors are likely to be choosing not to take a risk in situations where doing so could help me live with no regrets. An important factor in living with no regrets is to start living NOW as though I already own those behaviors, characteristics and lifestyles I want to achieve. By living as though I already do those things and live that way, they feel more real, more attainable and less frightening. As I mentioned in my last post, The Comfort Conundrum, when I apply Cantril’s ladder exercise to certain aspects of my life, it is clear that I will have regret if I don’t take action to make changes. Life is short and uncertain, so my approaching 50th birthday shines as a clear indicator that the time is now to steer my life in the direction that leads to a sense of accomplishment and satisfaction. On the cusp of 2019, I am ready to jump into the new year with power and purpose, as I work with coaching clients to do. It will take daily reflection to stay on the path of no regrets, but I am excited and hopeful and wish those feelings for you. What will you choose as your theme for 2019? How could committing to living with no regrets make a difference for you? Two weeks have already passed since Biking Across Kansas (BAK) 2016 concluded at the Missouri border, in Elwood, Kansas. I have learned so much on and through this annual ride. My experiences with BAK epitomize my major goal for this blog: celebrating my passion for cycling and the lessons and insight I glean through it. No doubt, more formidable crucibles exist, but I have found BAK to be a reliable forge for my evolving self. From my first BAK in 1999, when I was a runner-turned-novice-cyclist, accompanying my then-boyfriend (now husband), to my 18th BAK, as a seasoned veteran and BAK Board Member, I have moved through many phases of life; gained and lost animal and human companions, jobs and life directions; encountered physical and environmental challenges and felt my way through parenthood. Every BAK is different and special in its own way. These are my reflections on BAK 2016. We are almost always tougher than we think—if we give ourselves the chance to find out. I think my first real inkling of this occurred when I trained for, and completed, my first marathon, the 1996 New York City Marathon. After my introductory BAK three years later, my mom asked, “How did you know you could do it?” I realized that my experience in the NYC Marathon, as well as the encouragement and example that my husband and his friends provided, allowed me to have the sense of self-efficacy necessary to attempt to ride across the state. This year, I was privileged to help my son Logan discover that he, too, is tougher than he realized. Logan has grown up around cycling and has participated in BAK every year since I hauled him into the wind and up the Blue Hills in my belly. He has accumulated some road miles for each of the last four years, but this year, on a new road bike, he smashed his previous record and greatly surpassed his goals. At one point, while he and I were riding late in the week after leaving a SAG (support stop) where he had been complimented, I said, “People are really impressed with you, and they are amazed by how well you are riding.” He giggled and said, “Yeah, me too.” The 309 miles he rode boosted his confidence and helped him to realize that he is capable of taking on challenges that some may find unreasonable or impossible. I hope that this awareness carries over into other arenas in his life as he prepares to enter middle school this fall and beyond. The confidence that I have built by accomplishing challenging cycling goals continues to be invaluable for me. I felt stronger than ever. Last year, my as-yet-undiagnosed B6 toxicity and small fiber neuropathy were at their peak on BAK. While I enjoyed the ride, I knew something was not right, and I had thermoregulation issues that caused me a lot of discomfort and concern. I did not really tell anyone how much I was suffering at times. Once I was diagnosed and eliminated the supplements that led to the B6 toxicity, I began in earnest to make a conscious effort to minimize the negative stress in my life, manage unavoidable stress more effectively and optimize my nutrition. I was delighted to find this year that I felt strong and healthy on BAK. At one SAG in Highland, KS, a man told me, “It is just fun to watch you go up the hills. It is like your legs are just carrying you up like a little water bug.” While I appreciated the compliment, he might have retracted it if he had seen me in the hot, hilly headwind stretch that followed that SAG. However, I truly did feel strong and in control over the course of the week, perhaps stronger than on any previous BAK. It was a nice testament to the efficacy of the changes I have made in my life. The wind is just wind, and the hills are just hills. As I mentioned in my introductory post about my blog’s namesake quote, there was a time when I allowed myself to become stressed and frazzled by wind. There was also a time when seeing upcoming hills could psych me out. Since my son rode with me for 309 miles on a very hilly route, I had a lot of opportunity to observe his reactions to hills and wind. When we had a cornering tailwind, he enjoyed the hills and did not worry over them. Later in the week, though, when we faced some challenging hills in strong headwind, his enthusiasm for the hills waned. I tried to share my hard-earned wisdom with him. I have learned that I will get up the hill, albeit a slow, effortful slog at times. I will also reach my destination in the headwind. That, too, can be slow and painful, but I have learned to stay calm in both those conditions, as well as to remain unruffled in crosswind. Those can be unnerving, especially in hills, because the wind currents can become unpredictable and scary. I have learned how to talk to myself to stay calm and collected and peaceful. I tried to help Logan do this, too. I think my words helped occasionally, but I realized that experience is often the most convincing coach. He will probably have to learn these lessons on his own, in order to truly internalize them. Watching him allowed me to reflect on my gratitude for these cycling lessons and to recognize how much I have used them over the past year, as I have worked to manage my stress in healthier ways and to be happier in my daily life. Life is more fun if I am flexible and adaptable. There will be wind, and there will be hills, and I just need to flow with them. Biking Across Kansas provides abundant surprises and unpredictability. Will showers be warm, ice cold, a weak trickle or a needle-like spray? Where will we sleep tonight? What vegan dinner options will be available? On BAK and, I have found, in life, approaching the unknown with a sense of adventure, rather than dread, makes the ride and life much more enjoyable. If I remember the underlying truth—that there is nowhere I would rather be than BAK—I can weather minor inconveniences and irritations without allowing them to spoil the fun. The same is true when navigating the mundane realities of life. Perfect is the enemy of the good. I have been called “rigid” more than once. I prefer the terms “disciplined” and “driven.” I do acknowledge that I can sometimes benefit from relaxing. My nutritional plan on BAK is a perfect example. I never waver in my veganism, but it is not always easy or even possible to meet every one of my daily nutritional objectives while cycling through rural Kansas. This year, I did not always get as many servings of beans or greens as I would have preferred. It is tough to eat exclusively whole-grain pasta or bread, like I do at home. I promised myself this year that I would relax, do the best I could and not allow myself to become stressed if my nutrition was not perfect. I controlled what I could and let go of the rest, and I was very happy and got plenty to eat. Friendships formed and strengthened amidst shared challenge are unique and special. BAK provides an extraordinary medium for growing friendships. Longtime BAKers have shared memories of battling the elements together for many miles over many years. I enjoyed riding quite a few miles this year with my friend David, whose long-ago, matter-of-fact statement about the wind inspired the name of my blog. We share a special bond because of the road battles we have fought together and because of our common love of cycling. We have suffered and survived an 80-mile day with cold, torrential rain, small hail and 45-mph wind. He has stuck by me (twice) when I was slower than slow because of terrible heat cramps. He has worked on my bike roadside when I had mechanical problems. 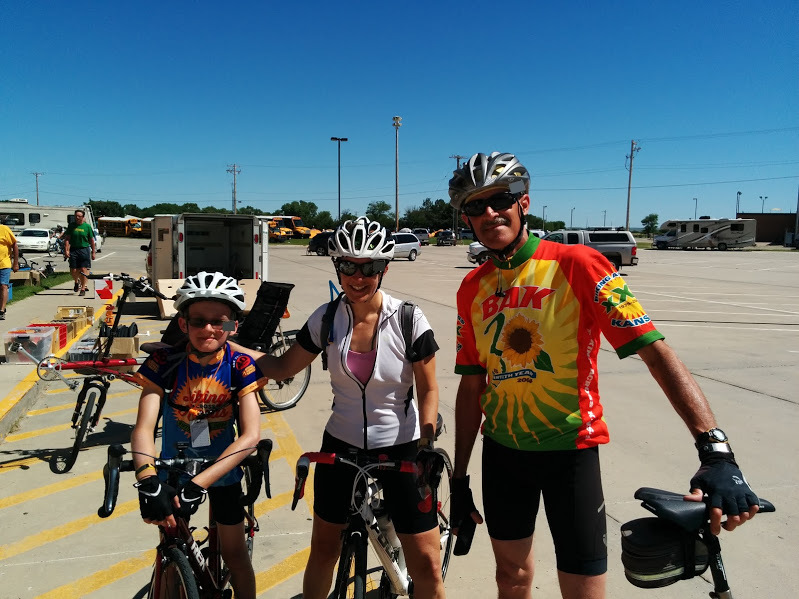 A few years ago, my friend Denise and I rode for a day with two young cross-country runners from Wamego, teaching them how to draft. Even my marriage is a result of cycling. My husband was literally on his bike when we met, and almost all of our dating and early-marriage entertainment was cycling. There is just something special about persevering together when it would be easier to quit. Sometimes easier is better. Before Kenny and I got together, he was a confirmed tenter on BAK. There was no sleeping inside the schools for him. I love sleeping in a tent, so I joined him in his conviction that the tent was the place to be. Once Logan came along, managing the tent and getting on the road in the mornings became more complicated. Over the past few years, and especially now that Logan is riding, rather than sleeping in, we have both realized that sometimes it is just easier and more fun to have one less thing to handle in the mornings (or even in the evenings). There used to be a sort of pride around sleeping in the tent, no matter what. Not anymore. This matches the question that I try to use to make decisions in the rest of life these days: “Will it bring more stress or more peace to my life?” Sometimes easier is better. Kenny and I both owned that truth more fully this year than in the past. We slept inside six of the eight nights. It was easier, and that allowed us both to enjoy BAK more. A concentrated week spent focused on the bike really illuminates the lessons I learn from cycling. I made a conscious effort this year to enjoy every moment and to avoid dreading my return to real life. Although I would head back out to the Colorado border right now to ride BAK again, I have been fairly successful at cherishing the experiences I had on BAK 2016 and allowing them to enrich my daily life, rather than to look back only with sad nostalgia, wishing my real life were different, as has sometimes been the case in the past. My goal now is to carry what I have learned from BAK 2016 with me on my training rides at home and in my daily activities as a mom, a wife, an academic advisor, a vegan advocate, a blogger and my assorted other roles. Doing so is evidence that I have truly internalized and incorporated into my being the gifts of the ride. The concept of a bigger yes translates for me to freedom earned through introspection to discover what really matters, awareness to recognize when something may jeopardize our priorities, focus to keep our yes in the front of our minds and self-discipline to say “no” to things that threaten what matters most. I am at my most empowered when I honor my bigger yes. Recently, the arena where a bigger yes has been most prominent is nutrition. For most of my life, I have lived a bigger yes when it comes to food. Because of my desire to live compassionately and my commitment to justice for all living beings, I have been vegetarian since 1982 and vegan since 2008. This was easy for me. The bigger yes was compassion. Ceasing my consumption of meat as a 12 year old required some creative maneuvering within my family, but it did not require willpower or sacrifice. I was clear that I cared more for animals than I did for eating their flesh. For so many years, I wanted to believe that being vegetarian was enough to satisfy my ethics. I allowed myself to linger in blissful ignorance for too long after better information was readily available. It was easier not to know. Until it wasn’t. For a long time, I had told myself that chickens didn’t suffer for us to eat eggs and that milking relieved the cows of their burdens. Deep down, I feared that I was lying to myself in my ignorance. Finally, compassion and commitment to my ethics became a bigger yes than convenience. As soon as I allowed myself to learn the truth, I became vegan. Sure, it requires asking more questions and being a bit more resourceful, but the inner peace of prioritizing my bigger yes makes any inconvenience well worth it. More recently, the nutritional bigger yes (coupled with my commitment to my ethics) is my long-term health. Toward that end, I have incorporated Dr. Michael Greger’s Daily Dozen app (See this post.) into my everyday life. That part was easy. It just meant some small modifications to my daily habits—adding beans to my morning smoothie to get a head start on my three servings; ensuring that I eat at least two servings of greens, plus a serving of cruciferous vegetables and including an eighth of a teaspoon of turmeric into my smoothies. These changes just meant eating even more of nature’s goodness. They weren’t difficult. More challenging was recognizing that I needed to give up some of my (healthful!) extras in order truly to optimize my health and fitness and avoid gaining weight. After reading How Not to Die, by Dr. Greger, I became serious about making my long-term health and well-being my bigger yes, even more clearly and more boldly than it previously had been. I have recognized in the past that I have had an addiction of sorts to dark chocolate and energy bars. During times of stress and anxiety, I have used these and other foods for comfort or security. Reading and internalizing Dr. Greger’s evidence-based, whole-food message, I recognized that my relationship to my comfort foods didn’t fit all that well with my nutritional objectives because of the added sugar and the processed nature of those products. Although the energy bars I ate were vegan and relatively healthful, my bigger yes is to maximize whole foods in my diet. So, I stopped a nearly daily habit of both the bars and the chocolate on January 1, when I started using the Daily Dozen app. (The date was coincidental—the day I learned about it—not by design.) In addition to added oil, which I had already largely eliminated, I also decided to avoid added sugar, even agave nectar and maple syrup, and to pay closer attention to the amount of sodium I consumed. Then, I increased my intake of some of the most healthful foods on the planet—dark, leafy greens; flax; beans and whole grains—but I kept a lot of my other little comforts. They were nutritious additions—bonus foods—to the Daily Dozen. My son had broken our scale, so I focused on how great I felt and enjoyed the knowledge that I was putting good food into by body, without worrying about my weight. Several weeks into this cycle, I went to the doctor for an annual check-up. Stepping on the scale, I realized that even this good stuff was causing me to gain weight that would not maximize my cycling performance or optimize my long-term health. Once again, it was time to acknowledge and honor a bigger yes. I decided to treat the Daily Dozen goals not as minimums, but as loose limits. By and large, I am consuming only the Daily Dozen now. This is not restrictive! There are so many wonderful, nourishing whole-food options. I am not automatically putting cacao nibs in with my nuts, eating nuts or nut butter several times a day or mixing vegan yogurt into my berries every single day. I still eat these things—nuts are part of the Daily Dozen—but I am eating just enough servings to meet the Daily Dozen goals, and cacao and vegan yogurt (one of the only processed foods in which I sometimes indulge) are truly occasional now. This allows me to honor my bigger yes. I don’t feel deprived at all. Instead, I feel satisfied and peaceful because I am clear about what my priorities are, and I am living them. These are my comforts now. Cycling is a bigger yes for me, too. It would be so easy to sleep in on a summer Saturday morning, but if I did, I might not get my long ride. The ride is a bigger yes than the leisurely start to the day. I know that I will feel better and happier with myself if I get up early to ride than if I don’t. Last Friday, I got up at 3 a.m. to take my mom for a medical procedure. Happily, it went well, and I was able to get her home by 1 p.m., avoiding the overnight hospital stay we had expected. When I got her settled at home, she suggested that I take a nap and then go for a bike ride (beautiful day in February!) before my son got out of school. I said, “I am going to go for a bike ride and then maybe take a nap because cycling is a higher priority.” It is not that sleep is not important; it just means that I had to make a choice, and that choice was to honor my bigger yes. The bottom line is that there is only so much that fits into any one life. We have to make choices. When we say “yes” to one choice, it means that we are saying “no” to another. Conversely, saying “no” makes room for a “yes.” The key is being devoted to a bigger yes, so that the noisy distractions can’t overshadow it. I view this as freedom. What matters most to me in life? What are my core, defining values for which I want to be known? What do I most want in this situation? What actions will help me to achieve my most important goals? Which choice will bring me the most peace? Where do I need to say “no” in order to make room for my bigger yes? Reflection and journaling can assist in clarifying the answers to these questions. Then we must commit to the bigger yes. We must decide that we are worth the courage, effort, sacrifice or social backlash that may come with the actions necessary to honor our bigger yes. As Johann Wolfgang von Goethe said in one of my all-time favorite quotes, “Things which matter most must never be at the mercy of things which matter least.” The bigger yes helps us hold on to what is most important and to resist the pull of distractions. I have often said that discipline is the reward for making a tougher choice, one that honors a bigger yes. With discipline comes freedom, which brings us closer to inner peace. The more I nurture my bigger yes, the freer and more peaceful I feel inside. That freedom is worth more to me than any taste, convenience, nap or social approval ever could be. The bigger yes often requires making the unconventional choice. That is okay. I choose integrity over convention any day. People don’t always understand or appreciate the choices we make to honor our bigger yes, but I have to live with myself one hundred percent of the time, so I choose to direct my behavior internally. As Covey said, it takes courage to do that, but the rewards are great.